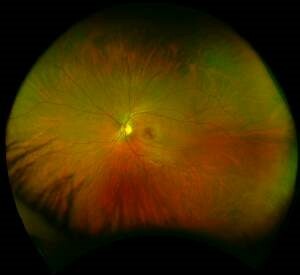 Because seeing the entire retina is so important, at TRANSCENDING EYE CARE, we have invested in the most advanced camera for ultra-widefield photography and angiography. In a single, quick shot, this camera produces “optomap” photos of about 82% of the retina. These optomap images provide superior visibility of the retinal periphery allowing us to see, document, show you, and follow pathology that could not be seen with traditional eye cameras. The optomap exam is quick and painless and combined with the thorough eye exams our doctors are trained to provide this advanced technology offers a new level of diagnostic confidence. We are proud and happy to offer this service to our patients.